Orient yourself with our Schoodic Outdoors Map. Every part of the Schoodic Byway offers opportunities for biking including U.S. Route 1, which is part of the U.S. Bicycle Route 1 along the eastern U.S. coast from Florida to Calais, Maine. All 19 miles of Route 186 are part of the Bold Coast Scenic Bikeway, including a 6-mile side loop out of the Winter Harbor village on Summer Harbor Road and the 6-mile one-way Schoodic Loop Rd in Acadia National Park, which offers spectacular scenery and is easy to ride. 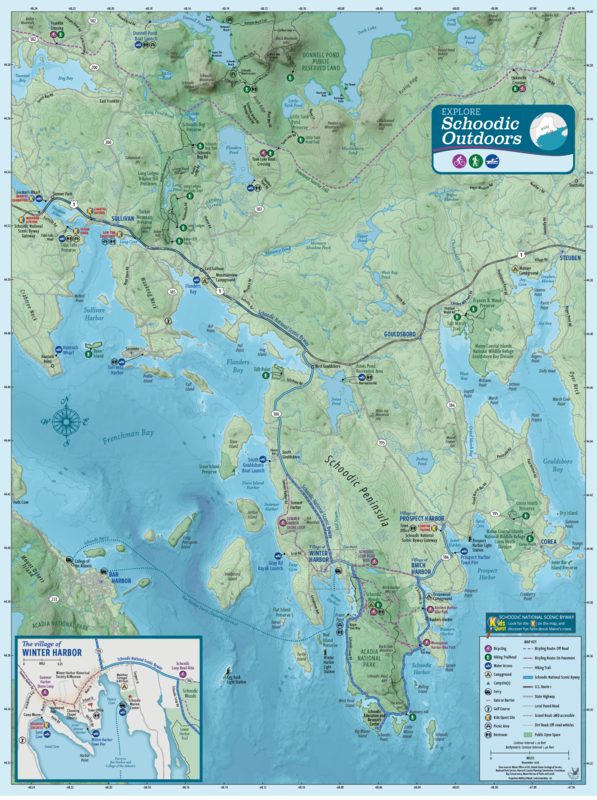 The Schoodic Outdoors map does not show a bike route from Prospect Harbor to Corea (Routes 186 and 195), but experienced riders may want to give this charming and scenic ride a try. Traffic is light, but there are no paved shoulders. The Bold Coast Scenic Bikeway is a 211-mile, on-road trail that winds along the rugged Atlantic coastline through 23 Maine, communities. The Scenic Bikeway begins at the intersection of Route 1 and Route 186 in West Gouldsboro, at the top of the Schoodic Peninsula, and runs east up the coastline to the international border city, Calais. Printable and digital maps of the Bold Coast Scenic Bikeway, as well as info sheets, are housed on Ride with GPS. Click here for information about bike safety, rules of the road, and other bicycling considerations. The Schoodic District of Acadia National Park offers 8.3 miles of non-motorized, gravel bike paths that wind through the hills of the Schoodic Peninsula. Start from the Schoodic Woods Campground day-use parking area to follow off-road gravel bike trails to create rides of different lengths. The nearby Down East Sunrise Trail is the longest off-road section of the East Coast Greenway, a trail from Key West, Florida to Calais, Maine. The trail parallels Route 1, beginning in Ellsworth and heads east 85 miles towards Eastport. This unpaved trail is managed for bicyclists, walkers, ATV’s, snowmobiles, cross-country skiers, and horseback riders. Cyclists will want to use bikes suited for rough gravel surfaces. For more riding options, integrate the Island Explorer into your itinerary by riding from point A to point B and then taking the bus with bike racks back to the start of your ride. See “More to Explore” section. Wherever you bike, be sure to take the necessary safety precautions, including wearing a helmet at all times. Happy cycling!